Devart has upgraded their SQL Server Data Access Components for Delphi XE7 Firemonkey to support Android and IOS. Previously the SDAC suite only supported Windows and Mac OSX but now it supports all four Firemonkey platforms. It has a Direct Mode which connects to Microsoft SQL Server directly via TCP/IP without any other drivers which is why it’s able to work on all platforms. A JDBC driver was one of the only ways to connect to SQL Server from Android and that required a lot of JNI code. Now you can connect directly with SDAC using native Object Pascal. It comes with base components like TMSConnection, TMSQuery, TMSSQL, TMSTable, TMSStoredProc, TMSUpdateSQL, TMSDataSource, TMSTransaction. Specifically for Microsoft SQL Server it has TMSTableData, TMSCompactConnection, TMSChangeNotification, TMSServiceBroker, TMSMetadata, TMSDump, and TMSSQLMonitor components. This Direct Mode access has also been added to another DAC suite they have (UniDAC) which supports more than just SQL Server. SDAC is a commercial component suite but there is a free trial available. These component should probably work in Appmethod as well. 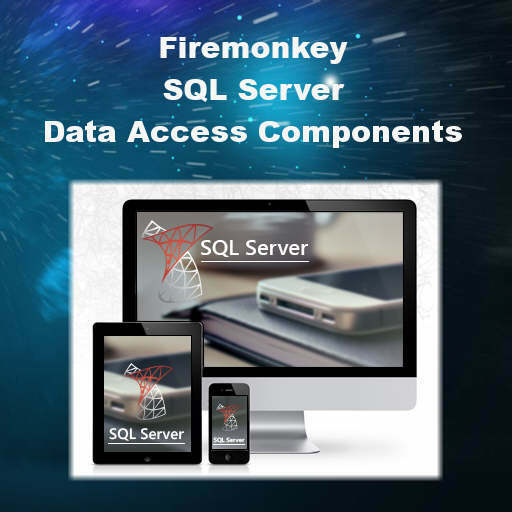 Head over and check out the full feature set of the SQL Server Data Access Components for Delphi XE7 Firemonkey on Android and IOS.